Wunderhouse Residence -Dormrooms, Madryt, Hiszpania : Rezerwuj teraz! Cancellation taking place 1 week before the arrival of the group, no refund given. 30% of the total amount of the booking payment in advance to guarantee the booking - this has to be done when the reservation is taking place. 70% of the remaining payment 1 week before the arrival of the group. The property is a historical monument built for the Marques de Villa Magna and contains many unique architectural features, in particular in our many spacious common rooms, which make our guests´ stay a unique experience. Wunderhouse Madrid is perfectly located in the heart of two of the city’s most popular neighbourhoods, you may rarely choose to take public transport. 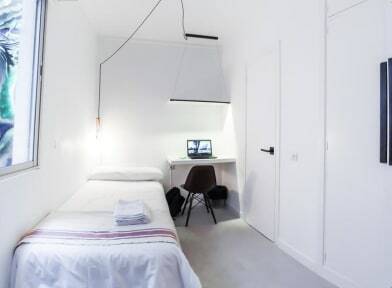 From food markets (Fuencarral and Barceló), late night supermarkets, cafes and restaurants to museums (including ‘Museo del Romanticismo’ and the ‘National Archaelogical Museum’) to Gran Vía’s nightlife and shopping, it’s easy to fit a lot into a day and night when you choose Wunderhouse Madrid as your student accommodation. The property includes 59 single bedrooms with en-suite bathrooms, as well as 4 dorm rooms with 4-6 beds each. All rooms have been entirely renovated in June 2015 in a contemporary design with the assistance of the up incoming Madrid designer.